Based on the architectural requirements, the front wall of the aqueduct at the East and West entrance should have a rounded shape with the radius of 5 m. There were two different structural options available. The first option was a complex round shape with in-situ concrete. This option would lead to very large dimensions and complex formwork. The second option was a simpler rectangular aqueduct with prefab concrete shell parts. The extra space on the surface level can be used for the service path. The second option was chosen since from the design point of view it was less complex and easier to construct. For the dividing walls beneath the aqueduct, the architect had the design requirement that 60% of the area be “gaps”. So the choice was made to make the dividing walls upside down ellipsoid shapes. This was meant to evoke the image of Roman-era aqueducts. The horizontal struts near the East Entrance should be made in concrete and create a lamella roof impression according to the architectural requirements. With the presence of the permanent struts in the deepest part of the access ramp, the choice for a pergola construction was obvious. The struts are made from pre-cast pre-tensioned girders with the dimensions of 800 mm width and 1,350 mm height. Because of the regularity of the supports, a slim deck slab with the thickness of 400 mm could be made. The West Entrance should be made with an open green character. 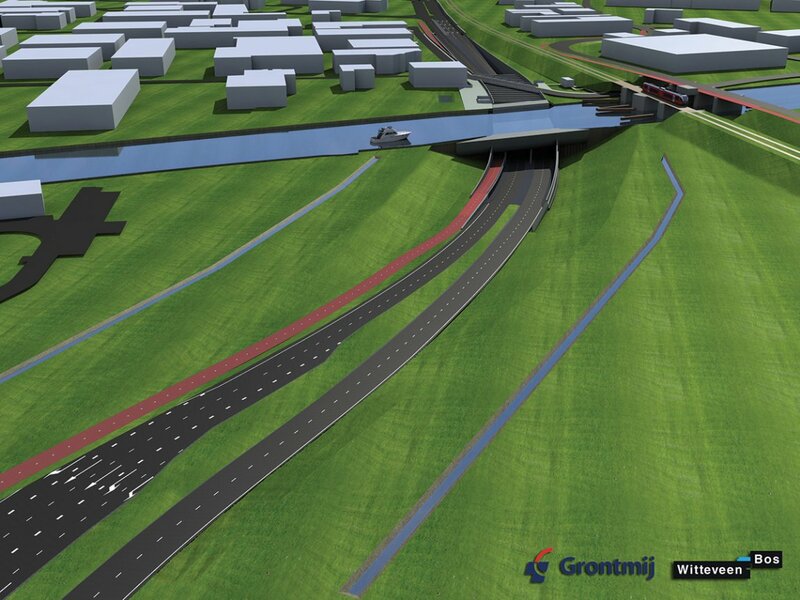 In the preliminary design an artificial polder containing a geomembrane was foreseen. After the soil and geotechnical research had been carried out, a strong water-resistant loam layer was identified at the West Entrance. Based on this layer, the design was optimised. We started from scratch with three MX-axes. One for the cycle path and one for each carriageway. 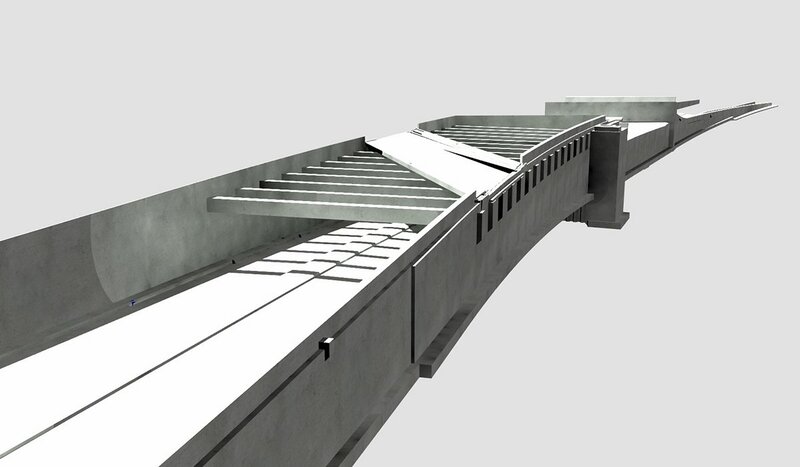 With the design constraints in mind, the model was generated using the Bridge and Tunnel Modeler. After its completion, the model was checked thoroughly by examining the design constraints one by one. When the main model was finished, the aqueduct casing, water cellar and the horizontal struts were modelled separately. We chose a separate design option because the last 3 parts of the model where not curved design-wise. For the main tunnel the segmentation was 2.5 m. This was chosen as it was the segmentation by which the building tolerance was within prescribed measures. When the model was ready, dimension drawings were made. For this the model had to be divided into separate tunnel sections, each section as a separate dimension drawing. 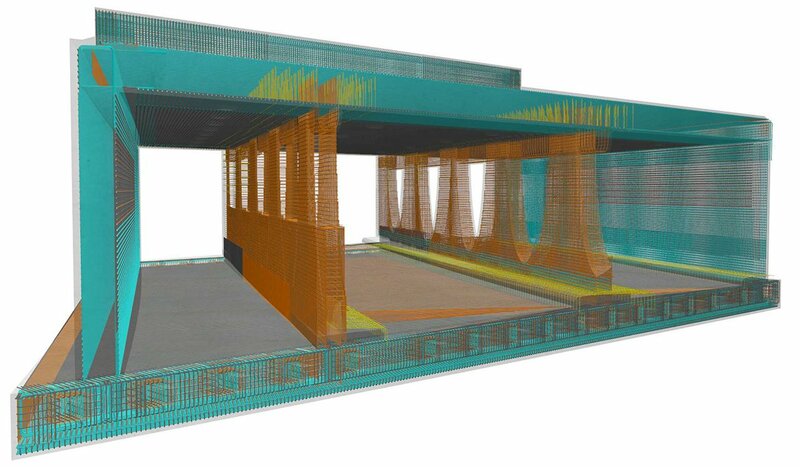 After completing the calculation, the rebar modelling could start. 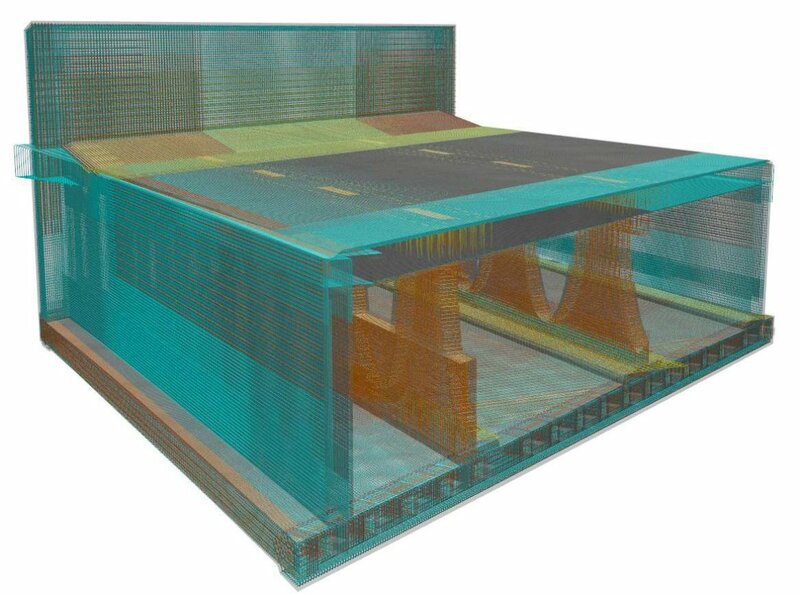 All rebar was modelled in 3D.